"What kind of Tomfoolery is this?" Supersonic Man (Ayesteran) has been sent from his home planet somewhere far away in space to save Earth. A sinister baddie, Dr. Gulik (Mitchell), is developing a weapon that could destroy the planet. To help him, Gulik kidnaps scientist Dr. Morgan (Caffarel) but Morgan refuses to cooperate, and they get into philosophical discussions of the nature of good and evil. Meanwhile, Morgan’s daughter Patricia (Polakov) gets into a relationship with Paul (Cantafora)...but who is Paul really? Throughout many travails - from goons with ray guns to a very slow-moving, flamethrowing robot, only one man can properly save the day...SUPERSONIC MAN! Being fans of director Simon, based on his Pieces (1982) and Slugs (1988), as well as being dedicated Cam Mitchell fans, we were excited when we came across a VHS copy (on the under-appreciated Star Classics label) of Supersonic Man at our local Goodwill store. We were not disappointed, as Supersonic Man is a hilarious treat of a movie. We feel sorry for anyone who cannot appreciate unintended genius like this. Obviously this is “inspired” by the 1978 Superman movie - everything from the main theme of the soundtrack, to the very humorous “flying” scenes, to the relationship aspect - but without even a fraction of the budget of that Hollywood picture. But lack of funds didn’t stop Simon, as this wildly wacky adventure proves. As for the aforementioned fan favorite, Cam Mitchell, he wears a killer bad-guy outfit as he takes on the role best described as a Mr. Big, Dr. Evil, or Dr. Claw-type of villain. Unfortunately, it doesn’t seem to be Cam’s own voice in the dubbing. But in the back-and-forth between Cam’s character, Gulik, and the scientist, Morgan, Gulik continually calls him “old man” and makes cracks about his age. This is quite funny because it’s not like Cam is some young punk teenager. He’s likely older than the other guy! 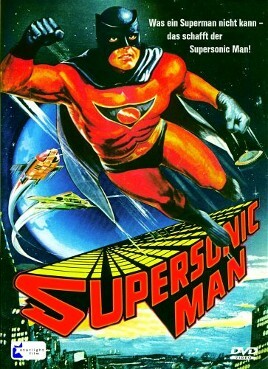 And that barely scratches the surface of the utter absurdity of Supersonic Man. There’s also a bit of Star Wars (1977), as Supersonic Man must say the phrase “may the force of the galaxy be with me” in order to activate his powers. 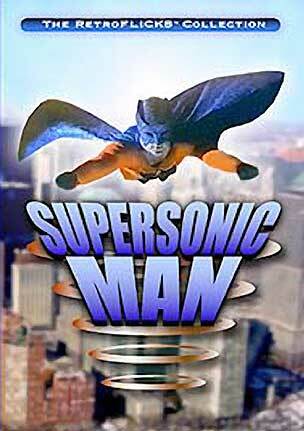 Plus, in the movie, he’s simply “Supersonic”, no “Man”. There’s even some pre-politically correct humor involving the town drunk. We can’t possibly go through all the wonderfully silly moments, you’ll just have to experience this gem of comic-booky, childish fun for yourself. You’ll more than likely have a blast watching this movie with your friends. Also check our buddy John Baxter's review at Knifed In Venice! Never heard of this before and just checked out the trailer on Youtube. I'm sold! Not just that quote he uses to transform himself but that battle in space looks extremely like Star Wars. Anything that is inspired by Superman and Star Wars is worth a try! Thanks for sharing this. Your welcome! This was hilariously great. Looking forward to your opinion. Always stoked when you guys unearth some random gem. Thanks! We definitely have some more gems coming up this month. Great review of a super fun film, have never met a person who didn't want it and love it. Have missed a lot of your reviews recently as I've been really busy, can't wait to catch up. John: Thanks for the nice comment. Supersonic Man is a gem you can't help but love.